Following the death of his ten-year-old son, physician Peter Croft embarks on a desperate, seemingly random search for a missing child, risking his sanity, even his life in a grief-induced quest. His journey propels him into the darkest reaches of human suffering and pits him squarely against an adversary whose own obsession defies all reason. 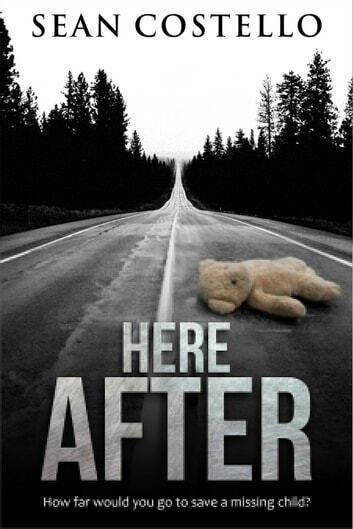 Here After is a story of love, loss, obsession and redemption, with gripping action sequences and a subtle paranormal underpinning. A compelling read from a seasoned storyteller, Costello’s sixth novel will keep you reading deep into the night. Here After has recently been optioned for film by David Hackl, director of Saw V.
"Costello knows his way around the mystery/horror genre, and he keeps the action moving and the suspense ratcheted up tight. He is very much a writer to watch..."
I couldn't put this one down, the characters are so real and it's such an emotional, and thrilling ride, I thoroughly enjoyed it! Should be made into a movie! Sean Costello should be a household name. His books get better with every new release! This is no exception!! Costello has produced a wonderfully heart-touching and terrifying thriller. He tackles an extremely difficult subject (the loss of a young child) with a realistic and straightforward approach, never forgetting the poignancy of so many dramatically different moments following such a loss. The novel opens with a dramatically shocking scene and Costello never really stops pulling the reader along. He is adept at grabbing the reader with both hands; one closes deftly around the heart, offering a touching and devastating glimpse of the loss of a child; the other propels you on a breathless quest, sometimes eagerly, the way a child might lead a parent through a fairground -- and sometimes with a startlingly quick choke hold on the windpipe. This novel is easily makes it onto the list of one of the best, most poignant books I've read in the past decade. Sean Costello is an mazing author both of Thriller and Horror novels! This is an amazing read and I can't recommend it enough! Here After is a book you won't want to put down! From the first page, Sean Costello captures your interest, making this book a nail-biting, "edge of your seat" read. He knows how to keep you wanting more......it's a great thriller!